I am extremely busy this week. But I want to share with you a short and simple recipe. 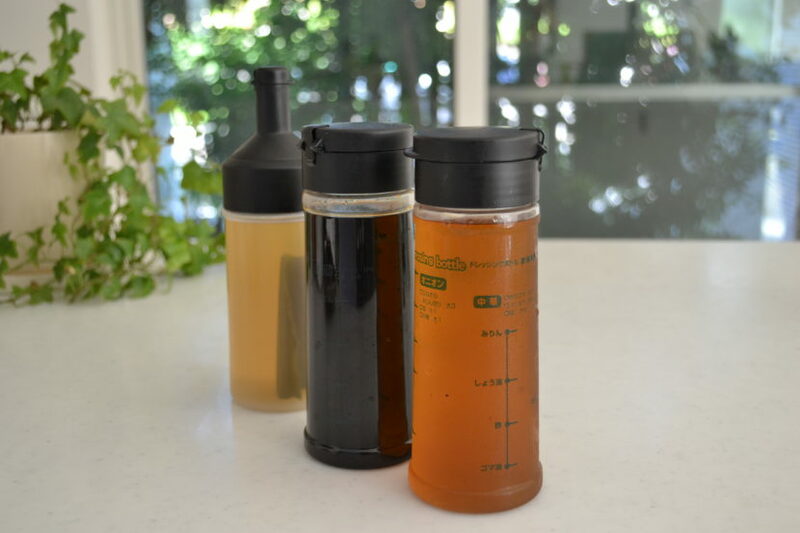 Today I want to share with you, how to make homemade teriyaki sauce and sushi vinegar. These are very basic Japanese seasonings which are indispensable in addition to Mentsuyu. It doesn’t contain MSG, so, it has natural Umami. You can make simple but tasty dishes in a minutes. 1.Put all the ingredients in a pot, turn the heat to medium and bring it to a boil. Simmer for 5 minutes then pass through a sieve. 2.Leave it until comes to a room temp. Transfer to a bottle, then store in a fridge. It will last for a couple of months in the fridge. 1.Put all the ingredients except kombu kelp in a bottle. Close the lid tightly and shake until the sugar dissolve. 2. Put a piece of kombu kelp in a bottle. Store in the fridge. It will last a couple of months. You can make sushi, or any other dishes in no time. I will show you how to make easy dish next week!